Pickpocket is generally considered to be one of Bresson's greatest films. Michel (Martin LaSalle) goes to a horse race and steals some money from a spectator. He leaves the racetrack confident that he was not caught when he is suddenly arrested. The inspector (Jean Pélégri) releases Michel because the evidence is not strong enough. Michel soon falls in with a small group of professional pickpockets who teach him their trade and invite him to join them on highly coordinated pickpocketing sprees in crowded public areas. Visiting his mother, Michel meets Jeanne (Marika Green) who begs him to visit his mother more often. His friend Jacques goes on a date with Jeanne and invites Michel along. But after stealing a watch, Michel leaves Jacques and Jeanne at the carnival. While they are at a bar, the inspector asks Michel to show him a book by George Barrington about pickpocketing, bringing the book to the police station on an appointed date. Michel goes down to the station on that day, with the book. At the station, the inspector barely glances at the book. Michel returns to his apartment realizing that it was all just a ruse to search his apartment. However, the cops failed to find his stash of money. Michel's mother dies, and he goes to the funeral with Jeanne. Later, the inspector visits Michel in his apartment, and tells him that his mother had had some money stolen, but later dropped the charges, probably knowing the thief was her son. The inspector leaves without arresting Michel, who decides to leave the country. He travels from Milan to Rome and ends up in England where he "spent two years in London pulling off good jobs", but throws his earnings away on alcohol and women. Returning to France, Michel returns to Jeanne, who has had a child by Jacques but did not want to marry him and is now left with nothing. Michel begins to work again to support her, but gives into temptation and goes back to steal at the horse track, where he is caught by a plainclothes policeman. Jeanne regularly visits him in jail. On one such visit, Michel realizes he is in love with her. 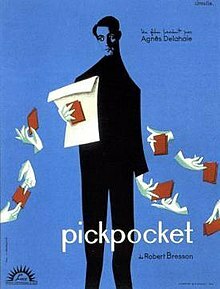 Bresson has said that Pickpocket "was written in three months and shot in the midst of crowds in a minimal amount of time." The resulting disorder proved to be a challenge during shooting, but was sometimes used to the crew's advantage, as in the Gare de Lyon sequence. The film is considered an example of "parametric narration" in which the style "dominates the syuzhet [plot] or is seemingly equal in importance to it". As in Diary of a Country Priest, some screen time is devoted to the protagonist's writings, and, as in A Man Escaped, the protagonist's voice is heard more in the voice over than in dialogue. The film uses two pieces of orchestral baroque music, which the credits attribute to Jean-Baptiste Lully. However, both fragments are taken from Orchestral Suite No. 7 by Johann Caspar Ferdinand Fischer. Roger Ebert sees echoes of Dostoyevsky's Crime and Punishment in the film. "Bresson's Michel, like Dostoyevsky's hero Raskolnikov, needs money in order to realize his dreams, and sees no reason why some lackluster ordinary person should not be forced to supply it. The reasoning is immoral, but the characters claim special privileges above and beyond common morality. Michel, like the hero of Crime and Punishment, has a 'good woman' in his life, who trusts he will be able to redeem himself.... She comes to Michel with the news that his mother is dying. Michel does not want to see his mother, but gives Jeanne money for her. Why does he avoid her? Bresson never supplies motives. We can only guess." Pickpocket exerted a formative influence over the work of Paul Schrader, who has described it as "an unmitigated masterpiece" and "as close to perfect as there can be", and whose films American Gigolo, Patty Hearst, and Light Sleeper all include endings similar to that of Pickpocket. In addition, his screenplay for Martin Scorsese's Taxi Driver bears many similarities, including confessional narration and a voyeuristic look at society. Schrader's admiration for Pickpocket led to his contribution in an extra in The Criterion Collection's DVD release in 2005. Pickpocket has been paraphrased by other films, such as Leos Carax's Les Amants du Pont-Neuf. Pickpocket was nominated for the 10th Berlin International Film Festival's Golden Bear award. ^ Semley, John (9 February 2012). "Robert Bresson". The A.V. Club. Retrieved 2 March 2017. ^ Cardullo, Bert, ed. (2009). The Films of Robert Bresson. Anthem Press. p. 203. ISBN 1843318253. ^ Bresson on Bresson: Interviews, 1943-1983. New York Review of Books. 2016. ISBN 1681370441. ^ Roger Ebert, (6 July 1997). "Pickpocket (1959)". Chicago Sun-Times. ^ Sheila Johnston (25 January 2003). "Film-makers on film: Paul Schrader". London: Telegraph. Retrieved 18 August 2007. This page was last edited on 26 October 2018, at 00:39 (UTC).